Samsung’s Unpacked Event is coming up in less than three weeks, so naturally, a number of leaks have started trickling out and alongside the new Galaxy S10, it seems Samsung is also prepping to release a new Galaxy wearable. But strangely, a new leaked image of the alleged Galaxy Sport shows a device that appears to be lacking the company’s most important smartwatch feature. Now just to be clear, the photo first discovered by 91mobiles is a render, and without knowing where the image came from, it’s difficult to say how accurate it is. But the real concerning thing isn’t its source, but what it shows, because based on the render, the Galaxy Sport doesn’t seem to come with a rotating bezel. If true, this would be a huge break from previous Samsung smartwatches, which for the past few years have featured a rotating bezel to help users navigate Samsung’s Tizen OS. The rotating bezel functions similarly to the crown on an Apple Watch, and can be twisted left or right to select apps, view notifications, and even dismiss alarms or calendar alerts. It’s a completely integral part of Samsung’s smartwatch design, and if the new Galaxy Sport doesn’t have one, it would be a huge mistake. 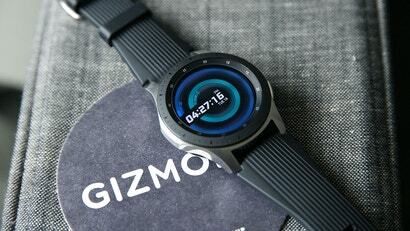 Look, there are a number of ways to improve Samsung smartwatches. Support for Tizen smartwatch apps isn’t great, curation in Samsung’s Galaxy Wear app is lacking, and the new Galaxy Watch — especially the larger 46mm model — is a bit too thick for most people’s tastes. But the rotating bezel on Samsung’s smartwatch is not only is its most unique feature, and it’s also the best combination of design and UX on available on any smartwatch right now. That said, even 91mobiles’ summary of the watch is somewhat inconclusive, as it describes the Galaxy Sport as having “a round dial with two circular buttons to perform the key functions.” From the render, it’s hard to tell where that round dial is, unless that line is simply referring to the watch’s circular screen. Rotating bezels aside, it seems the Galaxy Sport’s other new noteworthy feature is that it will be Samsung’s first wearable to support Bixby Reminders. This makes sense, because when you look back at the announcement of Samsung’s first Bixby-powered smart speaker late last year. The company seems poised to make a big push for its voice assistant in 2019. I will be shocked if the actual Galaxy Watch ends up looking like what’s pictured in the render, though it’s possible that Samsung really is making a big change on its second Galaxy-branded smartwatch. Either way, we should know for sure in just a couple weeks, so check back on February 20th for more info and details.